Cajeput Essential Oil is an effective anti-bacterial, anti-viral, anti-oxidant and mucolytic. It is also anit-inflammatory and analgesic. M. leucadendron var. 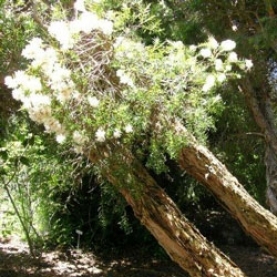 cajeputi is a medium sized tree to 98ft with small crowns with small branches, slender twigs with creamy white flower spikes. The bark is whitish, papery, thin and flaky. It can be indigenously found across the hot, humid areas of Australia and the Asain mainland. Cajeput has been traditionally used for its antiseptic, carminative and local analgesic properties by Australian Aborigines. In Malaysia and Indonesia, Cajeput is used to treat stomach and intestinal problems, valuable for colds & flu, chronic rheumatism as well as an insecticide. Cajeput was effectively used to cure Indian cholera. It has been used for eye infections and for relief for a toothache. Cajeput is an essential oil that can be used to fill holes in the auric field. It encircles us with energetic protection. There are times when we feel our energy either leaking away from us or we feel it being sucked out of us, leaving us feeling drained and tired. When we feel we need to seal our energy to keep for ourselves, we can use Cajeput essential oil to assist. Cajeput Essential Oil contains a significant percentage of 1,8 cineole which has been proven effective in clinical trials for rhinosinusitis, showing improvement in nasal obstruction (stuffy nose), nasal secretion (runny nose) and frontal headache. In another trial with chronic bronchitis, a comination of a-pinene, limonene and 1,8 cineole produced better results than anti-biotics. According to Tisserand & Young: Essential oils high in 1,8 cineole, like Cajeput essential oil, can cause CNS and breathing problems in young children. Avoid use with babies or children under five years old on their faces or in a steam. 1,8 cineole presents a low risk of both skin irritation & sensitization. Care must be taken when using with asthmatics. Do not apply to or near the face of infants or children.